The education department has paved the way for the recruitment of contract teachers, soon the education department will start the recruitment process for contract teachers. On Tuesday,the government gave its approval for the recruitment of contract teachers. Under this recruitment process, teachers will be selected on the basis of merit, and candidates will have to apply online for recruitment. Education department has already set major standards for contractual teacher’s recruitment, under which, candidates will be given 50-50% weightage on LT and TET scores and 20 percent on BEd score, along with this for the post of Professor, candidates will get 50 percent weightage on BEd and PG degrees. Candidates who want transfer from one place to another, can also resign and apply again. 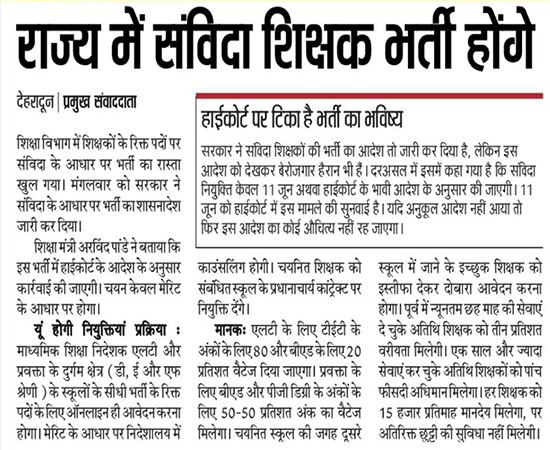 Help us to improve this article/job posting "Contract Teachers to be recruited soon in Uttarakhand". We would be glad if you can comment below and provide your valuable suggestions and feedback. If this page have any wrong information/list or out of context content, then you can report us as well.